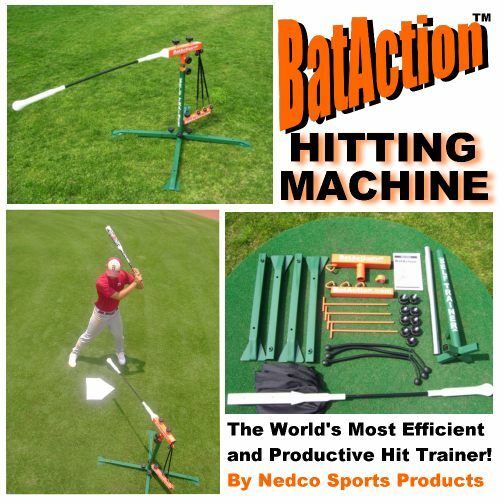 The BatAction Hitting Machine is the original rotational hitting machine made by Nedco Sports. 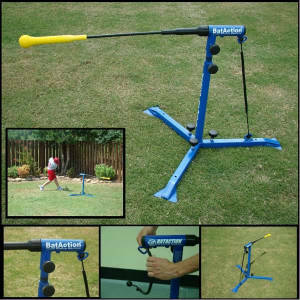 The BatAction Machine has a high speed moving ball that provides players with a simple, easy, fun, and highly productive way to practice baseball and softball batting skills at home or in a team setting. The BatAction Machine has height and speed adjustments for all ages and can be used for moving ball drills and stationary ball drills. Right-handers and left-handers can hit together without stopping and adjusting the machine. This feature makes practicing switch hitting simple and easy. The BatAction sets up in minutes and packs easily for travel to team practices or on road trips. The BatAction comes with a detailed easy-to-follow booklet that outlines batting drills, hitting tips, coaching points, and more. The machine is used for the popular 20 MINUTE HITTERS ULTIMATE WORKOUT to develop incredible bat speed, unbelievable hitting skills, and high levels of batter confidence. 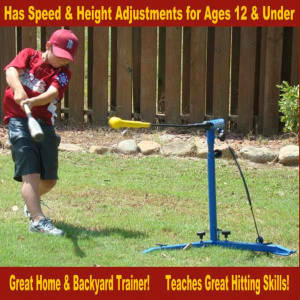 The BatAction Machines are 100% Guaranteed to Improve Hitting Skills or Buyers Receive a Full Refund of Their Money! The BatAction Machine provides batters with a productive and challenging workout that rapidly improves bat speed, improves hitting skill, and raises batting averages. BatAction Training Machine workouts are some of the most popular training drills baseball and softball players today. The BatAction Hitting Machine is one of the most economic ways a parent can help a player quickly improve their batting average and drastically reduce the number of strikeouts. This is the "Original Hitting Machine By Nedco Sports". 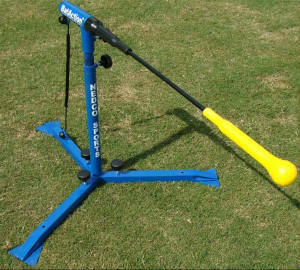 This great training machine has been helping hitters improve their batting averages since 1999. This machine carries a FULL YEAR WARRANTY on ALL PARTS and a 100% MONEY-BACK GUARANTEE! Is your player an underachiever at the plate? Is your player a future prospect that loves to practice and improve? Do you know that your player is a much better hitter than past performances indicate? Would your player be willing to spend just 1 hour a week performing exciting and fun drills that develop incredible skill and confidence? Did you know that for less than the cost of a new bat, you can purchase a hitting machine that can help make a young player's dreams come true? If you answered "YES" to any of the above questions, you are about to make one of the best investments you will ever make in your player's baseball future. Imagine the joy and excitement your player will feel when he or she becomes the team's best hitter! The Bataction Self-Trainer™ Hitting Machine is known and respected for improving skill and power and making batting averages sky-rocket! Why hesitate in making one of the wisest investments that can be made in a player's future hitting success? Buying a BATACTION SELF-TRAINER™ Machine is a NO-RISK purchase. If you are not happy with the results that you see, you simply pack it up and send it back for a FULL REFUND minus shipping cost. Call Our Toll Free Customer Service Number. Our staff will be glad to help you. Here at Nedco Sports, we have built our family business on the performance of the BatAction Hitting Machine! Since 1999 we have been building the BatAction Self-Trainer™ Machine! We sell thousands of machines every year! 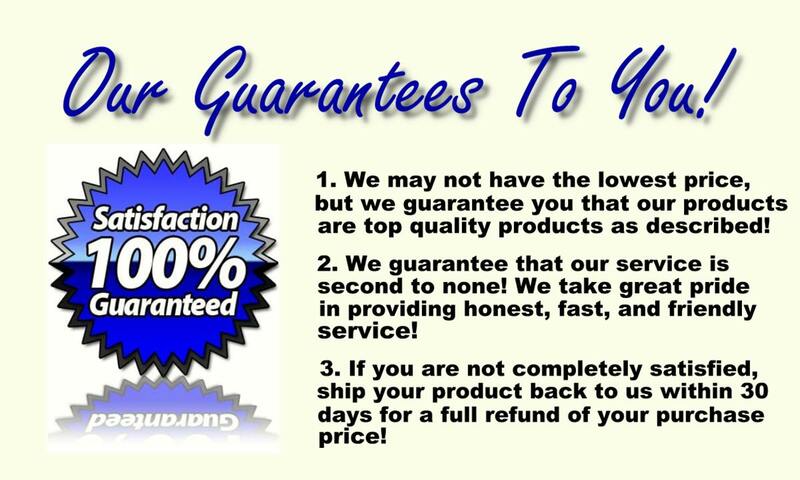 And we back every one with a 100% Money-Back Guarantee. We are baseball people making and selling the absolute best baseball hitting trainer that money can buy! We love this game! We love our machine! We know what it can do for you, your player and your team! We back the BatAction Self-Trainer™ Machine with the ABSOLUTE BEST WARRANTIES and 100% MONEY-BACK GUARANTEES in the industry! If you have questions, we can help! Call 1-877-431-4487 now! Give your team the BATACTION™ ADVANTAGE, Order Now! You will be glad you did! When you order, you will be transferred to our secure order site, Baseball2u.com/CoachesBest.com. You may also call Bill, Anna or Trey at 1-877-431-4487 to order by phone. Looking For BatAction Replacement Parts? CLICK HERE! We Ship within One Business day!